China Heading for Post Olympics Economic Bust? Something is going on in China that simply does not add up. Let's start with the GDP. ChinaView is reporting China think tank forecasts GDP growth at 10.2% in Q3 . BEIJING, Aug. 8 (Xinhua) -- China will record a GDP growth of 10.2 percent in the third quarter, roughly the same as the second-quarter level, according to a report released on Friday by the State Information Center, a government think tank. The report said consumption would continue to be a major driving force for the national economy. However, auto and home purchases ebbed notably in the first half, adversely affecting consumption in the third quarter. I doubt 10.2% growth is anywhere close to sustainable in a world economy slowing so fast that a global recession is visible on the horizon. 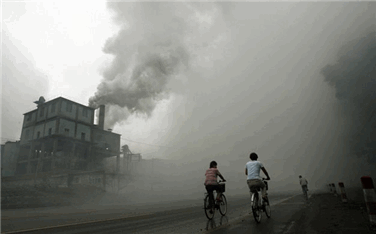 Furthermore China has a major pollution mess that needs to be addressed. 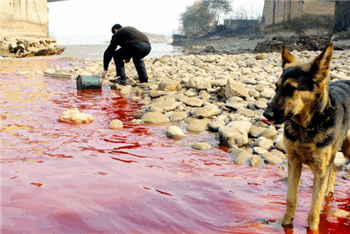 China is poisoning its land, air, water, and most importantly its citizens. The guardian has a gallery of eleven stunning images of Pollution In China . Here are a few of them. Here is a second piece of a puzzle that just does not quite fit. Forbes is reporting China considering 370 billion yuan economic stimulus package . China is considering a 370 bln yuan package of fiscal expenditures and tax cuts to stimulate the economy, the Economic Observer reported, citing a source close to the matter. The report said the plan includes 220 bln yuan in government spending and 150 bln worth of tax cuts. The plan received initial approval from the Central Leading Group on Economic and Financial Affairs, a body under the State Council, but further details will be finalized by the finance ministry and other government departments. If China was growing as fast as reported, one might think they should be putting on the brakes. Instead China is considering a stimulus. Other than pollution control, exactly what is it that needs stimulating? The stock market perhaps? Let's see how a third piece of the economic puzzle fits. Bloomberg is reporting China May Turn to Bond Sales to Bolster Stocks, Official Says . Aug. 26 (Bloomberg) -- China may let investors sell bonds that can be swapped for shares to deter equity sales and support the stock market, the world's worst-performing this year. The China Securities Regulatory Commission is studying exchangeable bonds as part of a package of measures to restrict sales of state-owned shares, said a Beijing-based official of the regulator who declined to be identified before a proposal is made public. The plan would enable state shareholders to raise funds without selling stock on the market, limiting supply after the benchmark index slumped 55 percent this year. Lockup restrictions are set to expire on shares accounting for more than half the combined $2.29 trillion capitalization of the Shanghai and Shenzhen markets. The overhang is the legacy of a 2005 government-led shakeup that converted non-tradable shares into common stock that can be bought and sold on exchanges. Under the commission's plan, shareholders wanting to sell after lockups expire would have to transfer their stakes to a third party such as a clearing house, according to the official. They would then be allowed to sell bonds to investors that could be swapped for the shares later. Whatever is going on in China, one thing is perfectly clear: The Shanghai Stock Index does not seem to care much for it. To that I will add that China's ridiculous scheme to prop up prices simply will not work. Another piece of the puzzle to consider is China's Olympic Sized Bust . The opening ceremonies were fantastic, but where was the payback? In a command economy there does not have to be a payback. Appearances are often more important than realty, and deviations from plans are simply not tolerated. Sometimes economic highlights appear in the strangest of places, like sports columns. Thomas Boswell, sports columnist for the Washington Post is reporting They Made the Buses Run on Time . At 3 a.m. on most Olympic nights, a bus with a few reporters would return to the Beijing Tibet Hotel. A dozen security officials met us to make sure we had credentials. During the day, knee-high tape outside the hotel created lanes for entering and exiting -- a reasonable way to keep things organized. But in the middle of the night in a sleeping city, the tape was irrelevant. So, exhausted, we'd step over the tape and take the direct route to the front door. And every night the security people objected, insisting forcefully that we obey the stupid tape maze. Finally, a Chinese solution was devised. Instead of stopping by the front door, our bus continued to the side of the hotel so, even though our walk was longer, the direct route now obeyed the tape. Common sense was irrelevant. The tape -- symbolic of a decision made by somebody somewhere in an unknowably complex and security-conscious control structure -- was all that mattered. They had uniforms. We didn't. That's big everywhere. It's huge here. All day long, every 20 minutes (to the split second), hundreds of buses run back and forth from media hotels to the Olympic venues. There's even a special "Olympic lane" for all official traffic to the Games. Because the Chinese are obsessed with appearing efficient, the number, size and frequency of buses comically exceed the need. I often had a bus to myself. However, I can barely believe what I saw Saturday when, by accident, I had to return to my hotel at 1 p.m., when almost no reporter has reason to leave the Olympics. Several football fields full of buses all pulled out simultaneously, headed to hotels all over Beijing, theoretically transporting media. But I was the only rider on any bus I saw. They still made their runs. They still wasted fuel. They still clogged traffic. But nobody, in an activity as state-controlled and Communist Party-scrutinized as these Olympics, would deviate from the original plan, no matter how stupid it might be. Everyone was helpful until you went one inch past where you were supposed to go. Then, arms sprang out to stop you. Everywhere you went, even alone at 2 a.m., you felt completely safe. Because every hundred feet there were a pair of guards -- at attention in the middle of the night. The complete lack of dissent here -- not one person could get a permit to use the designated Olympic "protest area," though some were detained for trying -- has an eloquence of its own. I'll leave here more concerned about China's future, and its impact on those around it, than the future of the United States. Part of that is probably xenophobia, though I've spent a lifetime repeating, "Patriotism is the last refuge of a scoundrel." Some of it, however, is my suspicion that the cycles of capitalism and the inflexibility of authoritarian regimes make for a spectacularly happy marriage in the virtuous-cycle good times, but perhaps an ugly partnership in the inevitable bad periods. China got aboard the free-market love train at roughly the time -- in the early 1980s -- that worldwide capitalism hit one of its long secular hot streaks that frequently last 15 to 20 years. Money couldn't wait to invest itself here. Let's see how the Party enjoys its first secular bear market. When political writers wander into sports, they often sound like rubes. The odds are high that I've merely flipped that script. But if China were a stock, based on what I've seen and felt at this Olympics, I'd downgrade it from buy to hold. Maybe things will get back to normal now that the Olympics are over. And maybe normal, whatever normal means, will start making sense. 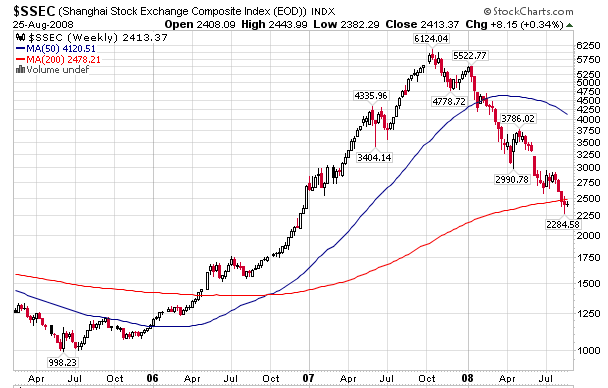 And Maybe the Shanghai index will soon be headed back to a new all time high. 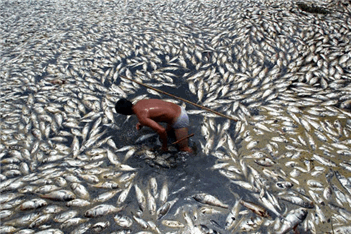 And maybe China's pollution mess just doesn't matter or better yet the mess will be cleaned up next year. But maybe, just maybe, China's growth story is starting to come unglued, in more ways than one.